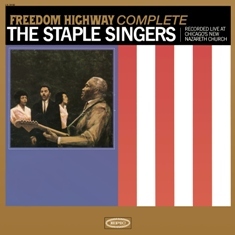 CD REVIEW: The Staple Singers, "Freedom Highway Complete"
The Staple Singers’ 1965 album, recorded shortly after the Selma marches, gets expanded and reissued. On April 9, 1965, shortly after the events that have been depicted in the movie Selma, the Staple Singers sang at a service at their home church, the New Nazareth Church on Chicago’s South Side. The album that they recorded that day, Freedom Highway, has now been expanded as Freedom Highway Complete, and will be released March 3. This new version, which shouldn’t be confused with their excellent compilation of the same name, adds 33 minutes to the original LP, giving listeners the entire performance, and in the proper sequence, which had been presumably compromised to even out the sides (the title track and “He’s All Right” were truncated on the original). But that doesn’t mean that it has a full half-hour of unreleased music. Of the new tracks, 17 minutes are comprised of Pops Staples’ intro and outro remarks, a benediction and, right in the middle of the album, the passing of the collection plate, which required a second go-round when Rev. John E. Hopkins noticed it was a bit light. “The Staples Singers [are] one of the best groups in the country,” he said. “This is awful. We’ve got less than $75 here. Now you know this is not right. This is nothing like right.” And while its inclusion is of cultural significance, if you’ve got a full iPod, you’re not likely to sync this seven-minute track or the others comprised entirely of speech. Still, Freedom Highway has been long out-of-print, so unless you had found a copy while crate-digging, chances are it’s all new to you anyway, especially since the hour of music that remains is this remarkable. A rousing take on “When the Saints Go Marching In” follows Pops’ introduction and you’re immediately sucked in. The group was at the forefront of the Civil Rights Movement, brought into the struggle after meeting with Dr. Martin Luther King, Jr. in 1963. This was reflected here with Mavis taking the lead on “We Shall Overcome” followed by “Freedom Highway,” which had just been written in response to the march from Selma to Montgomery for the right to vote. The immediacy, both in the lyrics and their performance, makes it one of the defining Civil Rights anthems. The Staple Singers are rightly and justifiably celebrated for their familial harmonies, but Freedom Highway reveals something else about them as vocalists. There’s a balance between Pops’ country drawl and Mavis’ powerhouse voice that I hadn’t previously noticed. His preaching brings the congregation in and then she drives it home. This is on display throughout, especially “Help Me Jesus” and “Tell Heaven.” And her rafters-shaking solo on “Precious Lord, Take My Hand” can’t be overlooked. Freedom Highway also serves as a reminder of what a great guitar player Pops Staples was. He rarely played on the hit Stax albums that they recorded with the Muscle Shoals Rhythm Section, but his bluesy accents and, most importantly, that Jazzmaster tone loaded with vibrato (or as he called it, “shake”) underpin the entire album. Originally produced by Billy Sherrill, who would soon go on to create the countrypolitan that dominated Nashville, the recording is primitive. Sometimes the vocals are obscured, either by the instrumentation or the singers’ rhythmic clapping. But the lack of separation emphasizes their trademark vocal blend. Besides, as Pops notes in the introduction, this is a service, not a concert, and what you get in exchange is the feeling that you’re in the church with them, participating rather than listening. Like Johnny Cash in the ‘90s, Mavis Staples is in the midst of a career renaissance on the strength of her last few albums, and a couple of weeks ago saw the release of Don’t Lose This, where she and Jeff Tweedy worked to complete the last recordings that Pops made before his 2000 passing. Freedom Highway Complete allows us to remember how she earned her status as a national treasure, and why she’s entitled to her current victory lap.